Whether it’s buttons, slime, LEGOs, robots, or something entirely different, makers and crafters will always find something fun at our makerspace! 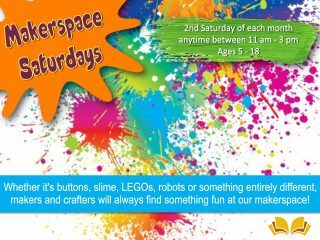 Drop in any time between 11 am and 3 pm on the 2nd & 4th Saturdays of each month to see where your imagination takes you! For ages 5 – 18. For more details, call the East Branch.